Alastair Cook has been confirmed as England’s captain for the World Cup while James Taylor has been given the chance to make a late claim for a place at the tournament and Ravi Bopara has the opportunity to revive his one-day career after both were named in England’s 16-man squad for the tour of Sri Lanka which starts in November. Despite England’s poor one-day record since reaching the final of the Champions Trophy – they have won just one bilateral series, against West Indies, and Cook was not captain on that occasion – he has the chance to play his first World Cup although the suggestion was that it was not a completely straightforward decision. “We debated all the positions in the team and Alastair’s was no different, but we are 100% committed behind Alastair Cook to captain not only in Sri Lanka but also the World Cup,” James Whitaker, the national selector, said. “He’s had his ups and downs the summer but he shown immense dignity and fortitude and we are 100% behind him.” Read the rest of this entry ? Muttiah Muralitharan | The ICC bowling report . 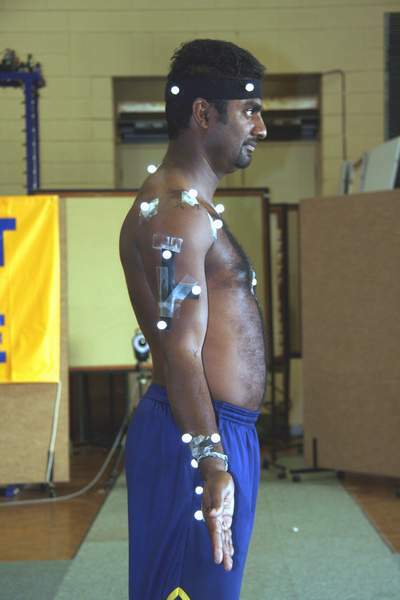 IN response to a request from the Sri Lankan Cricket Board, directed through Mr. Daryl Foster and the ICC (contact from Mr. David Richardson) Mr. Muttiah Muralitharan’s spin bowling action was assessed in the Biomechanics Laboratory of the School of Human Movement and Exercise Science at the University of Western Australia. This request followed the match referee (Mr. Chris Broad) lodging a “suspect bowling action report” on his “doosra” delivery during the recent Australian tour of Sri Lanka. Testing was therefore restricted to analysis of his “doosra” delivery. The testing occurred in a laboratory environment, which permitted a full bowling run up, such that a portion of the pitch was housed outside the laboratory. A laterally (side) placed video camera recorded his images during delivery to assist in the identification of ball release. 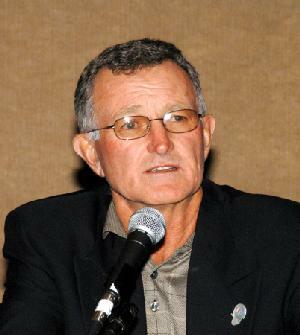 A front-on video camera was used to assist in the selection of the best `”doosra” deliveries.’ Mr. Bruce Yardley, a former Australian spin bowler, who commented on the quality of each delivery, also assisted this task. He had been present in Sri Lanka during the recent Test series and could therefore comment on the quality of the laboratory compared with on-field bowling. 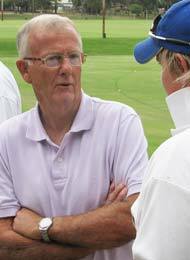 * His best six deliveries were then analysed. Those selected satisfied the criteria of breaking the appropriate way off the pitch and being bowled with appropriate intensity by the spin bowling expert. The results from this testing session were verbally providedto Mr. Muttiah Muralitharan and Mr. Daryl Foster. In an attempt to ensure that all efforts were made to comply with ICC Rules, Mr. Muttiah Muralitharan, following consultation with the UWA biomechanics testing team then underwent a period of `technique remediation’ with Mr. Daryl Foster, a renowned cricket coach. A final 3D analysis, following ICC guidelines was carried out on the 7th April. This report includes the results from both testing sessions. A preamble, prior to the presentation of these data is included, to assist with the interpretation of the results. Accuracy of measurement systemThe opto-reflective 12 camera Vicon System that recorded at 250 pictures/Sec has an error margin of approximately 1-degree in data collection. On-field recording systems, using a minimum of 3 high-speed video cameras for spin bowling, have accuracy levels of approximately 4-degrees, although these error margins were recorded in a laboratory environment (Richards, 1999). The identification of elbow and shoulder joint centres in on-field data collection, where a shirt is worn also involves large errors. In a match the ability to differentiate anatomical movements such as “elbow extension” by digitising segment end-points, particularly if you have segment rotations, is extremely difficult and prone to error. This is certainly the case with spin bowlers. It is therefore not surprising that laboratory testing is preferred, particularly for spin bowlers, where an appropriate pitch length and run up can be structured. This is clearly the only way to test players, where data would be able to withstand scientific and therefore legal scrutiny. bowler. However, while run up speed and length of arm are generally higher for fast bowlers, spinners such as Muttiah Muralitharan actually have a similar rotational speed of the arm system. Mr. Muralitharan recorded a similar time (=0.08s), from arm horizontal to release, to that recorded by Shabbir Ahmed Khan the Pakistan fast bowler recently tested by this team. Therefore a case can certainly be made for some spin bowlers such as Mr. Muralitharan to have the same range of acceptability in elbow angle to that of fast bowlers. The anthropometry assessment clearly shows that Mr. Muralitharan has a natural 35 degrees of elbow flexion during standing, which during the delivery action (under load) reduces to a value of approximately 24 degrees. Therefore any biomechanical assessment of his bowling action must take this 24-degree angle into account. In practical terms this means that his elbow joint, depending on the load, will always display at least some flexion. His elbow abduction angle is also such that it displays a relatively large “carry angle”. Mr. Muralitharan’s shoulder external rotation range is higher than normal, which allows him a greater range of motion during delivery. While this is an advantage in the development of speed, it also is a natural occurrence and does not therefore fall outside the bounds of human normality nor the rules of cricket. While this may be an advantage in bowling, it does not directly impact on the extension of the elbow. However, the external rotation at the shoulder, combined with the 18-degree “carry angle” and 24-degree of permanent elbow flexion (see dynamic flexion above) will give the impression of “preparation for a throw”. This is particularly true when the action is viewed in two-dimensions (e.g. television, or when observed by an umpire from a fixed position). 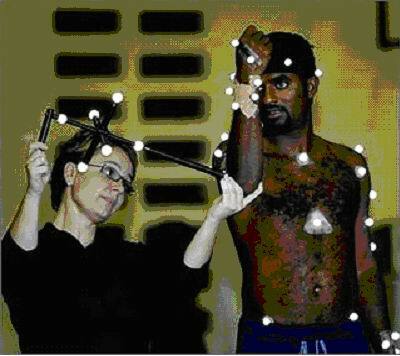 Mr. Muralitharan attended the biomechanics laboratory at the school of Human Movement and Exercise Science on April 1st 2004. The results from this initial testing session are presented below. Following a warm-up, markers were attached to Mr. Muralitharan as shown in Figure 1. The mean velocity of six deliveries selected for analysis was 64 km/hr. A mean elbow extension range of 14 degrees was recorded for these six “doosra” deliveries (Table1, Figure 2). The curves graphed in Figure 2 clearly show that each delivery was bowled with a similar action. One can then be confident that Mr. Muralitharan bowls with a similar action in his “doosra” delivery. While one could argue that this extension is acceptable it is outside the current extension threshold of 5 degrees set by the ICC. Hence a period of remediation followed aimed at reducing the level of elbow extension from upper arm horizontal to release. Following the period of remediation a second biomechanical analysis of Mr. Muralitharan’s “doosra” delivery was conducted on the 7th April, 2004. The results from this testing session are presented below. movement, particularly for spin bowling. The key to the issue with reference to a spin bowler, is the quality of the delivery and the rate of rotation of the upper arm. In our case Mr. Muralitharan produced high quality deliveries with an upper arm action that was similar in rotational speed to that of a fast bowler. to release was similar for the Test series and the laboratory testing. Mean ball velocity at testing session 2 of 72 km/hr was also at the upper end of the range commonly reported for Mr. Muralitharan under Test conditions. We therefore contend that the bowling action recorded was similar to that used in a Test match. A case may be made for Mr. Muralitharan’s initial elbow extension to be acceptable at 14 degrees. Particularly, when one considers the speed of his arm rotation is similar to that of a fast bowler and the only scientific data related to fast bowling suggested an increase in the acceptable extension threshold from 10 degrees to 15 degrees (Portus et al., 2003). However, the mean extension across 6 deliveries was outside current ICC guidelines for fast bowlers. For this reason a period of technique modification was carried out to reduce the level of elbow movement during the delivery of his “doosra”. Following this remediation his level of elbow extension reduced to 10 degrees, which is within fast bowling guidelines. We contend that because the speed of his upper arm rotation is as fast and in some cases quicker than fast bowlers, his level of acceptability for elbow extension should also be set at the 10-degree mark. With no spin bowling data base to make a comparison, this would seem both a wise and prudent recommendation. Following the findings from Portus et al. (2003) we would also recommend that the ICC consider increasing the fast bowling extension threshold to 15 degrees. Finally it is our considered opinion that Mr. Muralitharan be permitted to continue bowling his “doosra” at least until a valid data base is collected on the various spin bowling disciplines. The relatively minor level of elbow extension following remediation over the period from arm horizontal torelease is not believed to give Mr. Muralitharan an unfair advantage overbatsmen or other bowlers. Portus, M., Mason, B., Rath, D. & Rosemond, C. (2003). Fast bowling arm actions and the illegal delivery law in men’s high performance cricket matches. Science and Medicine in Cricket. R. Stretch, T. Noakes & C. Vaughan (Eds. ), Com Press, Port Elizabeth, South Africa: 41-54. Richards, J. (1999). The measurement of human motion. A comparison of commercially available systems. Human Movement Science, 18:589-602. ROSS EMERSON has recently been quoted in the Daily Telegraph in an interview that spanned the famous no-balling of Murali by him at the Adelaide Oval. 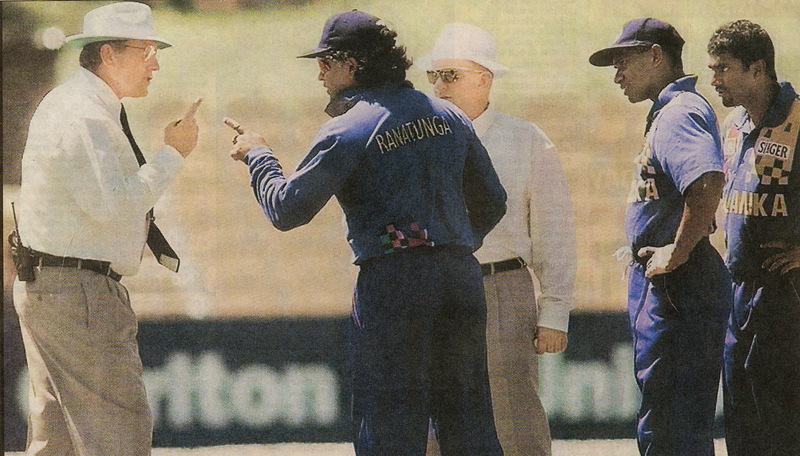 He is reported on as saying that he acted under instructions to no-ball Murali – an incident that lead to the famous partial walk-out on the 23rd of January 1999. It later surfaced that EMERSON was on “sick-leave” at the time! You are currently browsing the Critiquing Cricket blog archives for September, 2014.